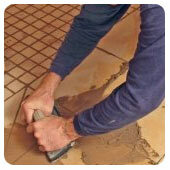 Do you have a broken ceramic tile? Shrinkage, cracked tiles and missing grout in the shower area will allow water penetration, leading to dampness in the wall behind and the formation of mould. Caused by volume increase in a tile after moisture absorption through porosity, usually over a period of years. Cracked tiles may have been caused by settlement cracks in the wall structure, vibration or impact damage. Cracks can be filled, but may not be completely invisible if there is any noticeable deflection in the face of the affected tiles. At Tile Cleaners ®, we have professional & experienced tilers in our team that can assist you with repairing your indoor & outdoor tiles and replacing the broken / damaged tiles.